Seattle went 0-4 against the Padres this season and are now 9½ games behind Oakland for the second wild-card spot. The Mariners, the team with 20 more victories, getting swept, this time at Safeco Field. For the second time in just more than two weeks, the Padres finished off a sweep of the Mariners, winning 5-4 on Wednesday afternoon. The Mariners might take some solace in the fact that this set didn’t seem to mean as much. When the two teams met at the end of August, the Mariners were just 4½ games out of the second wild-card spot and were seemingly primed to gain ground against the struggling Padres. Of course, that didn’t work out. This time, the Mariners entered the set 7½ games behind Oakland for the last postseason spot, with only huge optimists giving them much of a chance to make up that ground in the last three weeks. They are 9½ games behind Oakland, and the only chance seems to be mathematical, which would have been hard to believe on June 16. The Mariners’ dramatic 1-0 win over Boston that day lifted them to 46-25 and 11 games ahead of the A’s. But here we are, and the Mariners are heading to Southern California after a 3-5 homestand to play the Angels, where it could hardly get much worse than Wednesday’s ugly loss. “Obviously, a very rough homestand, and we did not play well against the San Diego Padres this year, there or here,” said Mariners manager Scott Servais. But it hasn’t just been one homestand or a couple of series that have derailed the Mariners. No phase of the game was good Wednesday. The Padres hit a pair of two-run homers off Mariners starter Wade LeBlanc, who got no help from his defense, and the Mariners were unable to overcome a 5-0 deficit even with a rare scoring outburst. Seattle scored three runs in the fifth inning, breaking an 82-inning streak of not scoring more than two runs in an inning. Mitch Haniger had a run-scoring single and scored on a ground out by Robinson Cano. That brought up Nelson Cruz, who punished a Joey Lucchesi pitch, hitting it into the upper deck in left field and giving Cruz the 1,000th run batted in of his career. “It’s about winning, and it doesn’t mean a thing if you don’t win,” Cruz said in a very somber clubhouse. 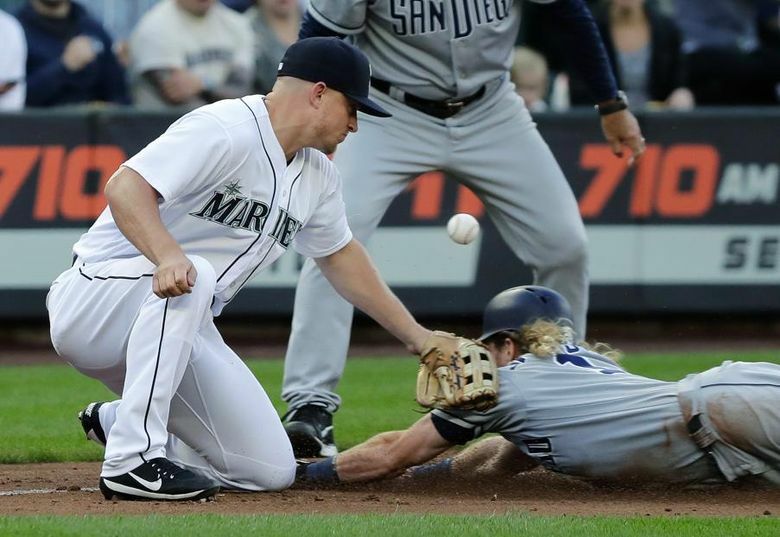 That flurry of runs in the fifth inning might have been enough had it not been for three errors – two by third baseman Kyle Seager – that led to three unearned runs. LeBlanc retired the side in five pitches in the top of the first inning, but it was a bit of a struggle after that. Austin Hedges hit a two-run homer to give the Padres a 2-0 lead in the second. A long two-run homer by Wil Myers gave the Padres a 5-0 lead, but he only hit that inning because Seager had a two-out throwing error, his second error of the game. After the Mariners briefly erupted in the fifth inning, the offense went dormant the next three innings, with nine straight Mariners striking out against four different pitchers. “They certainly shut us down and blew us away in those three innings,” Servais said. The Mariners ended the strikeout streak when Seager led off the ninth with a homer to center field. Dee Gordon followed with a bloop single, but the next three hitters went down in order. “We were hoping to get a little magic in the ninth with the leadoff homer and Dee getting on base, but it was not going to happen today,” Servais said. So the Mariners were left to wonder what if, about the game and the season. And now, Servais said, the rest of the season becomes a pride situation. “You’ve got to come out and be prepared to play and expect balls to be hit to you and make the plays,” he said. “Focus is the big thing. Be prepared and play with an edge. It’s a personal pride matter.